MARKETING – a lead is anybody who fills out a form or submits his or her name. SALES – a lead is anybody with an active project, with approved budget, with signing authority, within my target industry, within my territory, who is making a purchase within the next 30 days. FINANCE – a lead is a signed purchase order (that cost us zero dollars to generate). Of course, the challenge of not having a standard lead definition is that the organization is never talking the same language. That results in misaligned expectations and missed performance benchmarks. Ultimately, when revenue numbers are being missed, it results in a lot of finger pointing with everyone believing they’re right and the others have dropped the ball. There was a time when I would attempt to have a conversation with my Sales counterpart and negotiate an agreed upon definition. The meetings would always go well and I’d feel like we achieved consensus and mutual understanding. However, over and over again when we were missing our sales targets, Sales would blame me for sending inquiries rather than leads and I would act indignant claiming I sent qualified leads and that Sales simply couldn’t close the deals. When we drilled down on this disconnect, it would always come down to a difference of opinion on what we had agreed to. It was a vicious cycle. Then, on a bright sunny day surrounded by unicorns and leprechauns, there came a neutral third-party; the arbiter of any disagreements. Life became good and Sales and Marketing achieved harmony (sort of). I’m talking about SiriusDecisions. If you’re not familiar with them, they are a B2B market research and advisory firm specializing in sales, marketing and product performance benchmarks and frameworks. What they did for me was introduce two specific frameworks that I now use in every new engagement: the Demand Waterfall and the Lead Taxonomy. The Demand Waterfall is a wonderful encapsulation of a logical lead flow process. It describes how a lead can be generated, by whom, and where it goes next in the sales cycle. It delineates between a Marketing responsibility and Sales responsibility. It creates clear stage names. It gives Sales and Marketing a common framework and language and process. It’s not something that I created, nor is it something that my Sales counterpart created. It was developed by a neutral third-party based on best-in-class research. Nobody within the organization gets an upper hand but everybody benefits from a consensus understanding of how things work. I use this framework to model our customer relationship management (CRM) processes, our marketing automation processes, and our management dialog. 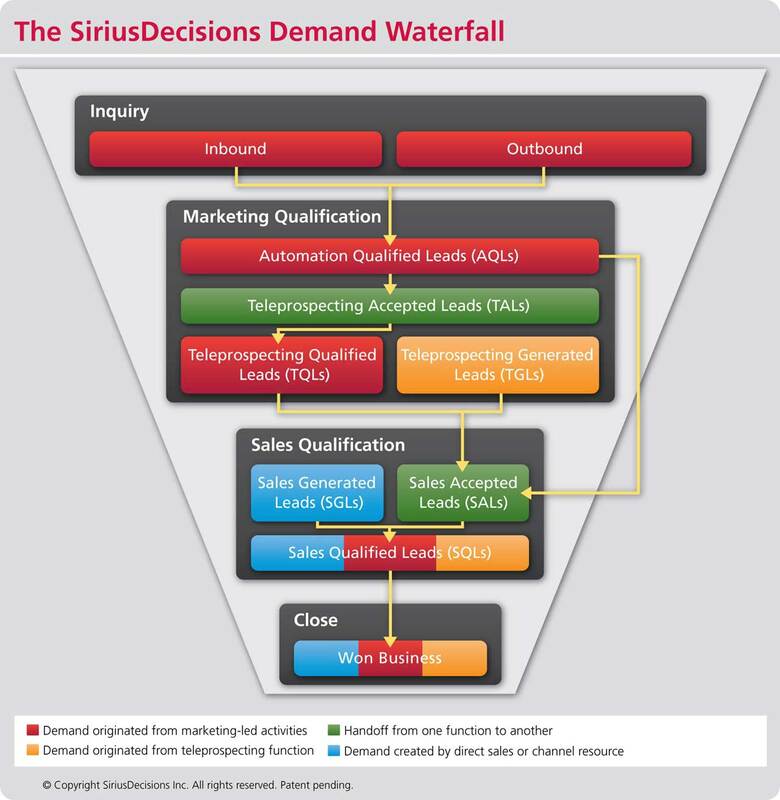 I then use the Demand Waterfall to create Service Level Agreements (SLA) between Sales and Marketing. These are agreed upon response times for each sales stage, action, or trigger (i.e. how long does Sales have to contact a newly qualified lead upon acceptance?). 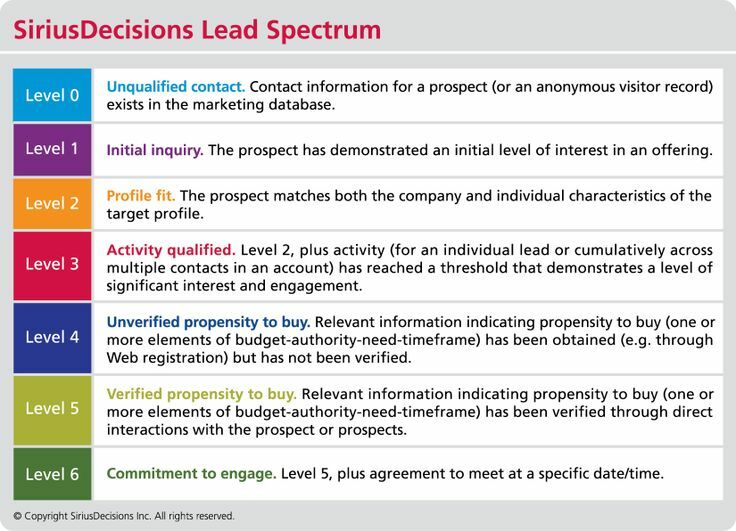 So what do these various levels really mean, when it comes to answering the question how do you define a lead? It’s easy. It means I score and grade leads based on their demographics, attributes, and BANT values. The handoff from Marketing to Sales happens when the lead score and/or grade reflect the lead definitions. It means I agree with Sales on what level of lead I will provide them, using the above definitions. Typically, I will agree on a Level 3 although I’ve had sales leaders demand the lead at Level 1 because they want to pursue the lead from that point onward. There is no right or wrong answer to what level of a lead Marketing should provide Sales. It’s specific to your organization and your culture. What there is, however, is a mutual understanding — Sales can safely challenge Marketing on a lead’s validity and Marketing can safely respond to Sales. The lines of communications are open and everybody is speaking the same language. The other subtle benefit of having an agreed upon lead taxonomy and lead definition is that I, as a marketing executive, have a much better understanding of what I need to budget and staff to support the lead handoff. For example, if I’m providing Level 4 lead then I need staff, and supporting technology, to do the lead qualification. If you combine that with a SLA that may dictate an 8-hour turnaround for the lead qualification, then I need to have enough staff to meet those commitments. As you can see, even though the title of this post is about defining what a lead is, the implications of not having a lead definition are massive. Further, not having a common framework to guide the discussion and the processes can result in missed opportunities as well as missed revenue numbers. Speaking candidly, my life has gotten much better since I’ve adopted this approach. Now, if I could only get something similar for my familial relationships then my life would be perfect.